He is likely best known for the song "Man of Constant Sorrow," which was featured in the movie O Brother, Where Art Thou? and won the 2001 CMA award for best single as well as a Grammy Award for best Country Collaboration with Vocals (along with Harley Allen and Pat Enright, filling out the vocals for the movie's Soggy Bottom Boys). In total, he has won 10 Grammy awards for solo and collaborative projects. Tyminski was born June 20, 1967 in Rutland, Vermont and plays a bluegrass style that blends traditional and pop traditions. 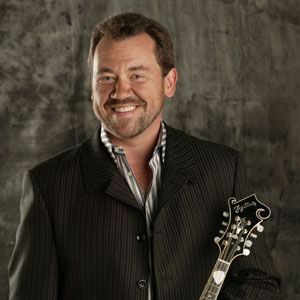 Before becoming a member of Union Station in 1994, Tyminski played mandolin and sang in the Lonesome River Band. Though Tyminski's love and feel for traditional bluegrass didn't come from growing up in the southern Appalachians, he absorbed and learned the music just the same. He credits his brother Stan with getting him hooked on the guitar and mandolin at the age of 6. While Stan was in the Navy and home on leave, he left his mandolin with his younger brother. While in high school Dan and his brother formed a band called Green Mountain Bluegrass. Dan played the banjo with that band for nearly five years. In fact, Dan says that he was primarily a banjo player from the time he was twelve until he was in his early twenties. When he was twenty-one, Dan was hired to play mandolin in the Lonesome River Band. When asked how he landed that job, Dan said, "It was a word-of-mouth thing. We ended up playing some shows at the same venue and when the position came up for a musician, one of the guys in the band recommended to Tim (Austin) that they give me a call." Dan played the mandolin with the Lonesome River Band for about five years. While he was still with the Lonesome River Band, Dan got a call from Alison Krauss. Tyminski attributes his love for traditional bluegrass to such musicians and singers as Del McCoury, Ricky Skaggs, Tony Rice, Larry Sparks and Jimmy Martin. Dan Tyminski and Ron Block played together at the 2004 Crossroads Guitar Festival. They performed "I am a Man of Constant Sorrow" and "Road to Nash Vegas".